“They [The Saudis] had a very bad original concept, it was carried out poorly, and the cover-up was one of the worst in the history of cover-ups. (…) Very simple, bad deal; should never have been thought of. Somebody really messed up. And they had the worst cover-up ever. And where it should have stopped is at the deal standpoint. “When bad men combine, the good must associate; else they will fall one by one, an unpitied sacrifice in a contemptible struggle.” Edmund Burke (1729-1797), Irish statesman, author, orator, political theorist and philosopher. 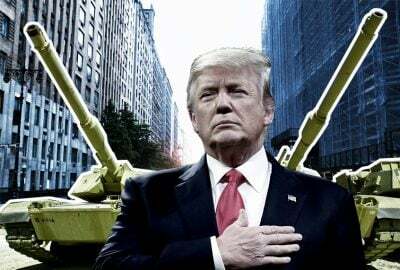 As a politician, Donald Trump is the image of the United States government, which attempts to maintain the American military-industrial complex. He needs “enemies”. He seems to need “enemies” to establish his own political identity and to possibly deflect attention from his own flaws. He has no adversaries; he has “enemies”, whom he brands “enemies of the people”. This is not a trivial matter because this is a totalitarian rhetoric. Indeed, some violent, oppressive and fascist dictators and demagogues have been known to use the epithet in the past. We think of Adolf Hitler (1889-1945) in Nazi Germany, Vladimir Lenin (1870-1924) and Joseph Stalin (1878-1953) in the old USSR. Their aim: to stir up political hate and to delegitimize their “enemies” and anybody who dared to criticize their totalitarian governments. Mind you, those were bona fide dictators. That Donald Trump casually uses violent political rhetoric to delegitimize his opponents should be a source of concern for anyone who values democracy. Donald Trump has called the Democratic presidential candidate Hillary Clinton, an “enemy”, going so far as accusing her of being crooked, without advancing any evidence for such a serious accusation. He has also called the free press and journalists his “enemies”. He brands them as “fake news media”. He has often attacked athletes and Hollywood stars in the same manner, and he has insulted scores of others. Trump has bullied everybody else, including the Fed Chairman who should have politely told him that his reckless pro-cyclical economic policies are politically motivated and are contrary to good economic management. That politician Donald Trump can get away with such rowdy and incoherent behavior is most astonishing. At the United Nations, in September, he was openly laughed at, and he has become a source of derision and fear around the world. His blind supporters do not see that, but the world does. In a true democracy, leaders do not vie for absolute power for themselves or their family, and do not consider those who run for office in free elections as being “enemies”, but as legitimate opponents. Calling political adversaries who advance different political proposals “enemies” is the language of dictators and autocrats. On the other hand, President Donald Trump seems to have a penchant, if not an open admiration, for autocrats and totalitarian leaders in other countries. For example, he has professed to be an admirer of communist China President-for-life Xi Jinping, going as far as publicly joking that this was “great” and that “maybe, we’ll have to give that a shot some day!” Donald Trump has also been cozy with North Korean dictator Kim Jung-un, with Turkish autocrat Recep Tayyip Erdogan, with Philippines dictator-to-be Rodrigo Duerte and with other similar junta autocrats or tyrants while turninga blind eye to their records of brutality and oppression. The world is now witnessing this with astonishment, because it is a throwback to the 1930s, when many democracies were replaced by dictatorships. However, nothing beats the efforts Donald Trump made to jump to the defense of the Saudi government and to cover up the assassination and dismemberment (with a bone saw) of Saudi journalist and U.S. permanent resident Jamal Khashoggi. That odious crime was carried out by a Saudi 15-man kill commando in the Saudi Arabia Consulate in Istanbul, Turkey, on October 2, 2018. Initially, Trump said that he talked to Prince Mohammed bin Salman who assured him that “he had not given the order” for Khashoggi’s assassination, even though some of the killers were members of his entourage and were his bodyguards. Then, Trump went out of his way to say “he believed” bin Salman’s denials, as if an alleged killer would admit such a barbarous crime! When the Saudi government came up with the most outlandish fabrication that the journalist had died in a “fistfight” with a 15-man kill commando who had come from Saudi Arabia to assassinate him, Trump declared that the Saudi claims were “credible”, even though the entire world met such claims with derision. Indeed, it defies logic and common sense that in a totalitarian religious state like Saudi Arabia, paid agents of the government would take it upon themselves to assassinate and dismember a known critique of the regime, and do that in a foreign country, without an explicit go ahead from the very top. However, when the dismembered parts of the journalist’s body were found in the garden of the Saudi consul general’s home in Istanbul, and when the Turkish government declared that it had evidence that Khashoggi’s assassination inside the Saudi Consulate was premeditated and carefully planned, and that “from the person who gave the order, to the person who carried it out, they must all be brought to account”, Trump’s attempt to cover up bin Salman’s crime became untenable. Then, Trump stated that the killing of the Saudi journalist Jamal Khashoggi in Istanbul was “a bad deal” (sic) and that “someone really messed up.” He went on to announce cosmetic “sanctions” against the members of the killing commando, but without mentioning the higher-ups who ordered the killing and especially, without implicating the alleged culprit, Mohammed bin Salman. Donald Trump seems to place emphasis on the way the Saudis have “botched” the crime, not that they had “committed” the crime in the first place. Some say that Donald Trump is an amoral and immoral person, being unable to rely on any personal ethics to distinguish right from wrong, in order to assess a situation. This could be a vivid example. As days go by and President Donald Trump reels from crisis to crisis, my assessment of the man from day one stands, i.e. that ruthless businessman Trump’s imperial presidency is “a threat to American democracy and an agent of chaos in the world”. Dr. Rodrigue Tremblay is the author of the book “The Code for Global Ethics, Ten Humanist Principles”, and of “The New American Empire”, and the recently published book, in French « La régression tranquille du Québec, 1980-2018 ».